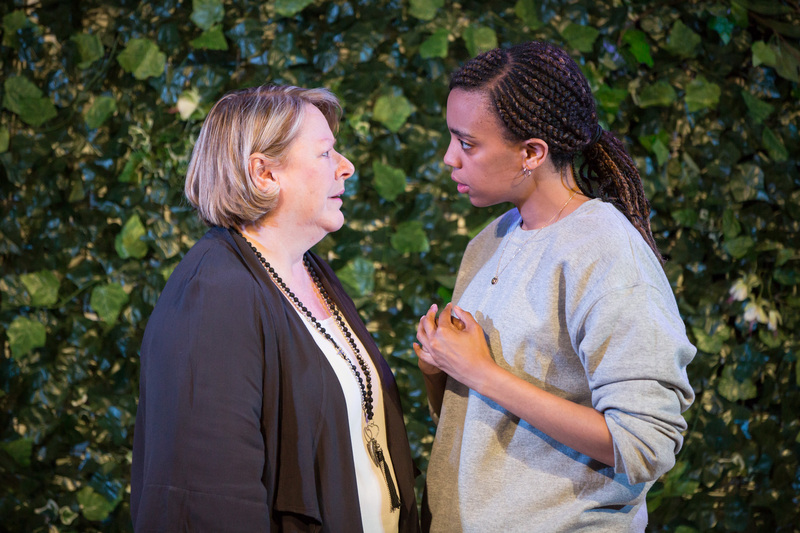 Cookie crumbs: Rosemary Waugh reviews Sabrina Mahfouz’s play about abortion and miscarriage. The Love I Feel is Red at the Zion Community Space. Photo: Camilla Adams. Every once in a while the Tobacco Factory Theatre in Bristol puts on its “a Play, a Pie and a Pint” events. And if there are two things I like as much I like going to plays, it is very likely beer and items baked in pastry, so I’m pretty much the ideal audience member for such a marketing scheme. However, despite finding out about this neat trilogy of theatre and carbs a good few years ago, Saturday was my first outing to aPaPaaP. In the back of my mind the choice of Sabrina Mahfouz’s The Love I Feel is Red, a play about abortion and miscarriage, seemed an incongruous programing choice to accompany hearty baked savouries and ale, but in reality the pies and pints all arrive an hour before the show starts, so whatever the subject matter there’s no real need to worry about dropping goats cheese and sweet potato down your front as the actors say their lines. In fact, the very normalcy of the setting in contrast to the topic is in keeping with Mahfouz’s programme notes stating an aim for abortion to be far less taboo and far easier to talk about. Even over a pie, for instance. The Love I Feel is Red is staged as a stilted conversation between two women, intersected with a series of monologues. The simplicity of the format is effective in again suggesting the familiarity of the situation – a mother having an awkward cup of tea with her son’s girlfriend. The situation is full of routines. The clash of taste over houseplants, the forced offering of sweet foods, the complete impossibility that this conversation will ever become natural even though it has now been years since they first met. Heather Williams plays Susan, the older of the two women, with beautifully clipped tones that fill the room with the smell of tweed and W.I. tea tents. Thwarted in her own ambitions by the interruption of motherhood and now left shattered by grief, she is mummified, so tightly contained. With her perfectly controlled upper middle class surface hiding globules of pain, she is like a Laura Ashley ceramic vase whose insides are filled with a swirling mass of dishwater. “I bake now”, she declares with rising intonation. She bakes. And in one sentence she makes the simplest of should-be-joyful activities sounds so utterly full of sorrow I feel like I may have to avert my eyes the next time I come close to a Mary Berry cookbook. She bakes like the armies of Betty Friedan’s depressed housewives. She bakes to act out a desire to be needed, to be the mother figure who feeds people, the great creator who puts things in ovens and, like an ancient creation myth, takes out more little people. Janet Etuk as the visiting Mona cuts out all these layers of crap in one clenched fist with crumbs raining from it. “The thing about cookies,” she tells us, “is that they crumble.” And she is right, because human or dough, all of the little creatures that come from the oven are sadly frail, capable of returning to crumbs or dust. There is an emphasis on human physicality in The Love I Feel is Red. The upper limits of physical strength are explored through mentions of Susan’s opportunity to coach the Olympic swimming team, and Mona and her son’s parkour. Their physical beings are the most important part of these two characters. Their passion for sport and their shared embodied experiences of pregnancy in the end unite them. There is also an emphasis on the physical experience of abortion and miscarriage itself. In connection with the title of the play, the focus is on blood. So much blood. The reality of early medical abortion (abortion induced by taking a series of pills, rather than having surgery) varies between women, as does the perception of pain and blood, especially in times of great emotional stress. Mona’s experience in the play should be understood as a depiction of a woman suffering a particularly agonising abortion as, according to written testimony by women who have undergone this procedure in real life, the experience of physical pain and volume of fluid differs. At times the poetic quality of Mahfouz’s writing seems too good to be true when used as dialogue. Lines that would work beautifully as spoken word poetry sound too unnatural when said in conversation – extended metaphors don’t fall from people’s lips that smoothly. The concluding reconciliation also seems to happen a little too easily, given the level of animosity that has occurred before. However, despite this, The Love I Feel is Red is a work that has much to say about physicality and humanity, whether soaring across rooftops or crumpled on the bathroom floor. The Love I feel is Red was put on by Tobacco Factory Theatres. Click here for more of their programme.